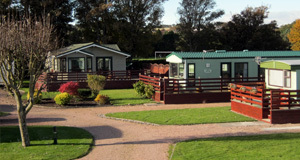 Available at the end of October, this Pemberton Elite is sited on a lovely spacious, sheltered pitch with a full length timber balcony included in the price. 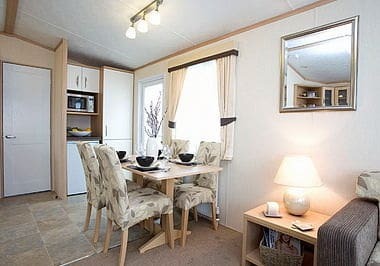 Like all Pembertons, the Elite is extremely well built and this model is double glazed and centrally heated. The spacious lounge has extensive seating incorporating a pull out sofabed and the U-shaped kitchen boasts plenty of work surfaces and cupboard space. The dining table and chairs are not fixed and therefore can be moved around to accommodate more guests. There are two entrances into the Elite which gives this model an advantage in terms of layout and there is a door between the kitchen and the corridor to keep warmth in and noise out. Near the back door there is a generous storage cupboard where shoes and coats plus cleaning equipment can be hidden away. The bedrooms are bright and welcoming, the master bedroom has a walk-in wardrobe that houses a dressing table that could also be used for a television. 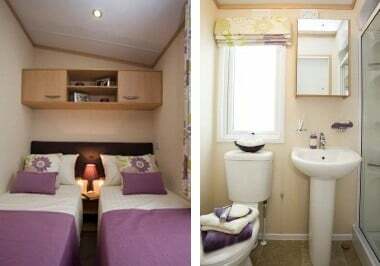 Even the twin room has a large dressing table alongside good wardrobe space. Superior mattresses are now included as standard throughout. 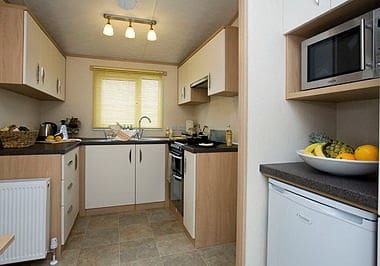 Please contact us to arrange a viewing of this caravan in advance.